Now, I continue my (lame) quest to see every film nominated for Best Picture earlier this year. Here, I move onto my 7th out of the 10. I've given every Picture Nominee the full 5 stars so far, until this one. Read on to find out why. "The Fighter" tells the delicate story of two brothers, Micky and Dicky (Mark Wahlberg and Christian Bale). Both are boxers, who come from the same complex family. Dicky is retired, and constantly off his head on crack, whilst he is supposed to be training up Micky, who is becoming a "stepping-stone" for other boxers to defeat on their way to glory. Soon faced with a new deal and a new girlfriend (Amy Adams), Micky is set to improve, but with Dicky in prison, and his mother (Melissa Leo) constantly hounding him, his journey seems tougher than he previously thought. Can he continue on his journey to win a title? I tell you what, you've all heard of Fantastic Four, right? Screw the superpowers; we have a real Fantastic Four right here. Wahlberg, Bale, Adams and Leo are all fantastic. I honestly cannot fault them. Why Wahlberg was not nominated for an Oscar is beyond me, he really deserved it. Bale definitely deserved his Award, as did Leo; although, I did think Adams was slightly better. The acting is the film's best point, it's probably the best lead casting I have ever seen. So, the reason that I didn't give this the full 5 stars as I did the others. The others are enjoyable. Despite being serious, they all have their own comedy elements, little light hearted scenes to break the tension a bit. "The Fighter" didn't. It stays one tone throughout, and the majority of the characters hardly change. This means the film is a bit too tense in some scenes, which it didn't necessarily need to be. That, and it was a bit clichéd, too. Other than that, though, I can't fault it! But, another great thing about "The Fighter" is its simplicity. Director David O Russell could easily have tried to add loads of twists and make it overly complicated, but thankfully, he didn't. It's just one straight forward plot that never loses the grip it makes to us within a couple of minutes. It just holds you there, in suspension. The almost two hour journey just flew by; it felt like half an hour. I'm not into boxing at all, but it doesn't matter. 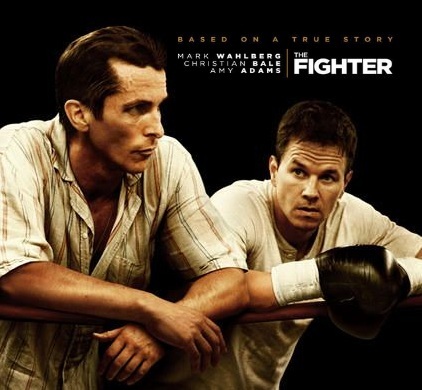 "The Fighter" is magnificent. I've only got three films left to see until I've completed the Best Picture nominations; 127 Hours, True Grit and The Kid's Are Alright. Who knows if they can be as uplifting, and astonishing as this. To Summarise: Making fantastic use of the exceptional leading cast at its hands, "The Fighter" constantly keeps its gripping and emotional atmosphere from start to finish.